Study for a qualification in ITIL Service Design (SD) by taking an online training course from 4PA e-Learning! This course is accredited by PeopleCert, who are licensed by AXELOS as an Examination Institute for an ITIL Service Design qualification in IT Service Management. ITIL Service Design (SD) is a free-standing qualification and is one of five ITIL Service Lifecycle modules that can work towards you achieving your ITIL expert qualification. The purpose of this course is to help you gain a detailed understanding on industry practices in service management as documented in the ITIL Service Design publication. This course focuses on the design of IT services and covers the architectures, processes, policies and documentation that will enable you to design services that meet the needs of the organization or programme. With this course, you’ll receive 6 months access from the date of purchase as well as FREE 24 hour tutor support! Good service design can improve the alignment of IT with the overall business and user needs and the qualification will illustrate the importance of designing consistent service design practices in order to achieve this. This course is intended for management and supervisory level staff. You may be involved in Service Design yourself, or you may just wish to understand the processes and principals involved, as they affect the work that you do. The design process is vital to the continued improvement and development of services within the IT lifecycle. Why Study ITIL SD with 4PA ? All 4PA e-Learning courses run entirely over the web and have been carefully designed to provide the most comprehensive, interactive and flexible learning experience available. Study when it suits you – at home, at work or on the move. This eLearning course contains all the learning materials you need in order to prepare for the ITIL Service Design exam. Our course has been accredited by PeopleCert, who are licensed by AXELOS as an Examination Institute for the ITIL® Service Design Certificate in IT Service Management. In addition to the resources provided, the examination guidance recommends that candidates should complete at least 20 hours of personal study. This module covers the purpose, goals, objectives and scope of service design and the business value of service design activities. The context of service design in the ITIL service lifecycle and the inputs and outputs of service design are also covered, including the service design package and service acceptance criteria. The learning objective for this module is to gain sufficient knowledge, to interpret and analyse service design principles, techniques and relationships and their application to the design of effective service solutions. The module covers the managerial and supervisory aspects of service design processes. It excludes the day-to-day operation of each process. More detailed process operation guidance is covered in the service capability courses. This module covers the service design activities and techniques within requirements engineering, and those in relation to data and information management, as well as application management. This module covers the Service Design roles, responsibilities and capabilities. Techniques for assigning roles are also introduced and explained. In this module you will gain sufficient knowledge, to interpret and analyze technology considerations in Service Design. This module covers the service design issues, prerequisites for success, and the six stage implementation approach. Pertinent techniques are addressed and reviewed, business impact analysis, service level requirements and risks assessment. This module covers the challenges and risks facing service design and how critical success factors (CSF) contribute to service design. The module enables you to understand the challenges, risks and critical success factors relating to service design. This module summarizes the material covered in all previous modules and prepares candidates for the examination. Thinking of sitting the ITIL Service Design Exam? On this page, you will find everything you need to know! In order to achieve this ITIL Intermediate qualification, you must pass the ITIL® Service Design Certificate in IT Service Management exam. To pass the exam you must get 28 out of 40 questions correct, or 70% and If successful, delegates will gain 3 credits towards ITIL Expert level. The course materials provided in the Service Design eLearning course will provide you with all the information you need for this exam. Why not try out a free trial module from our ITIL Service Design eLearning course! In this ITIL Intermediate trial module, you will learn about the purpose of service design, its objectives and scope and how it delivers value to the business. It also describes that Service Design is about development of services which convert the objectives from Service Strategy into portfolios of services and service assets. 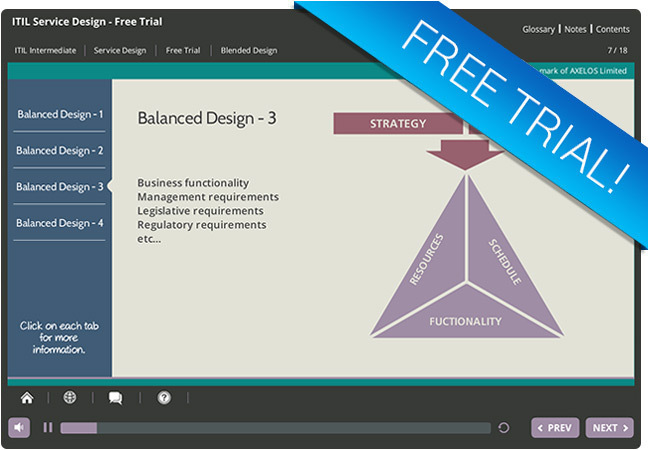 Like the full ITIL Service Design (SD) eLearning course, you can access this free trial module from any device whether you are at home, at work, or on the move! ITIL® and the The Swirl Logo™ are registered trade marks of AXELOS Ltd. Used and reporodued with the permission of AXELOS.